Hi guys! 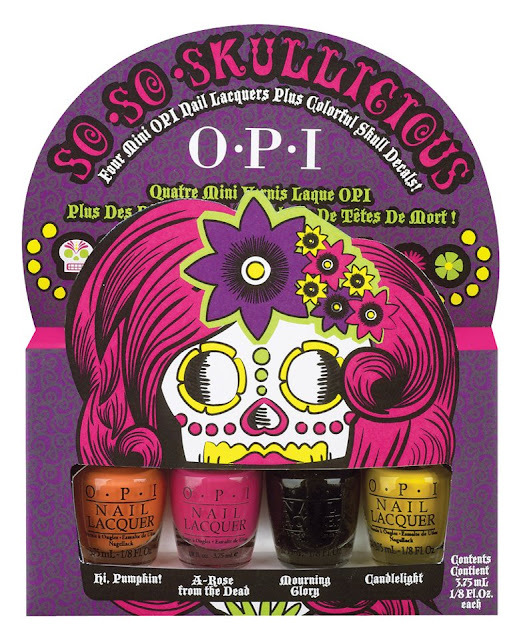 Today I'm showing you OPI's 2012 Halloween mini collection! It's called So So Skullicious and contains four mini opi shades and some nail decals. I personally don't find it very halloween, in fact without the black it's more of a summer looking collection to me. Anyway, onto the swatches! A bright vibrant orange creme. Beautiful, but by no means unique. A bright pink creme, three coats again. Bright Yellow Creme, I needed four coats with this. I persoanlly think this collection is a big miss. All four colours are so easily dupeable, and because they are such mini bottles & brushes I find them hard to apply. The decals aren't great either..
Hmm, can you tell I'm dissapointed in this collection? colors are so cool and vivid, but yes, I agree with you!